At the time of this writing, Devin Graham of Devin Super Tramp has 779,244,531 views on YouTube and an astonishing 4,118,120 subscribers, but before he was a celebrity filmmaker, he was a kid making music videos with his siblings. Throughout his career, he’s kept that same childlike sense of adventure and wonder; he’s documented athletes who, inspired by the video game Assassin’s Creed, have developed insane parkour skills, jumping from one rooftop to the next in costume. He’s captured bike parkour and extreme pogo freestyle, which yes, incorporates the pogo stick, beloved by children worldwide. Graham hasn’t lost the playfulness and enthusiasm of his childhood; the only thing that’s changed is his equipment, and he’s upgraded big time with an LG UltraWide® 21:9 monitor. Graham’s ambition has driven him to carve out a niche and an audience that is uniquely his, and he’s made a point of using only the best, state-of-the-art technology. No matter how many followers he has, he has never ceased asking himself, “Okay, what’s the next big thing?” Right now, the next big thing is his monitor. The UltraWide® is different because it’s fully immersive, and Graham and his team have upgraded from filming at 16:9 to filming at 21:9. 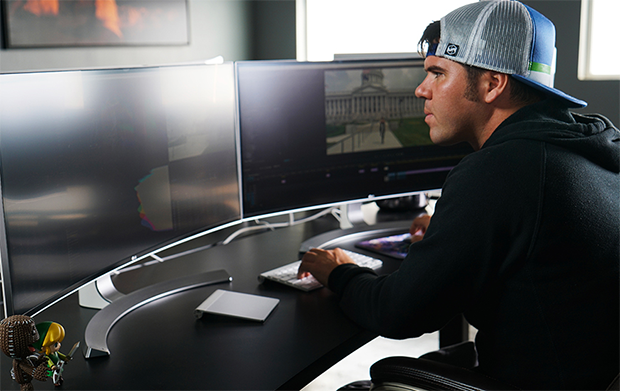 This change can’t be underestimated; says the filmmaker of his videos, “now we can make it look like it was an actual movie.” The display covers over 99% of the sRGB color space, and the Super Tramp team edits, sound designs, and color corrects on the monitor, housed in their studio in Provo, Utah. Says the filmmaker of his LG monitor, “It just makes things so much easier and so much faster, because the technology is getting so much better.” Now, he has time to connect with his followers and build a community of filmmakers and photographers; he’s devoted to giving back through tutorials and behind-the-scenes glimpses. He has inspired millions, and is grateful every time he gets an email from someone whose life he’s changed. Of extreme pogo riders Dan Mahoney, Dalton Smith, Nic Patino, Graham writes, “It’s all about pushing the human boundaries, because you want to grab people’s attention.” In so many ways, he’s doing the exact same thing, but instead of his body, he’s using his eyes, his intellect, and all the tools at his disposal. LG is a Feature Shoot sponsor.